Sean Rafferty's guests include conductor Odaline de la Martinez and early music group Ensemble Odyssee. Plus soprano Johannette Zomer and the Tulipa Consort performing live. Sean Rafferty's guests include conductor Odaline de la Martinez ahead of London Festival of American Music, and soprano Johannette Zomer, who sings live with the Tulipa Consort. 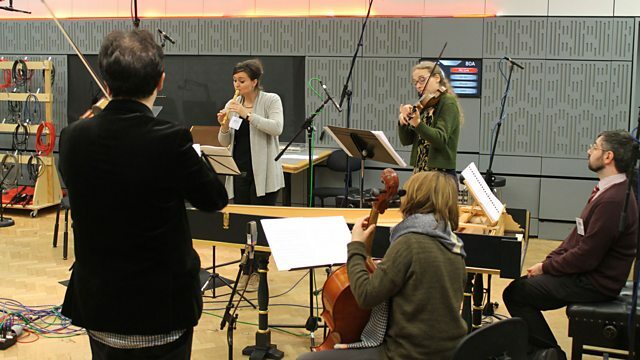 Plus live performance from early music group Ensemble Odyssee. Conductor: Colin Davis. Orchestra: Staatskapelle Dresden. Mozart Overtures Sir Colin Davis Staatskapelle Dresden. Orchestra: Orchestre des Champs‐Élysées. Conductor: Philippe Herreweghe. Mendelssohn: Midsummer Night's Dream: Herreweghe. Performer: Ian Bostridge. Performer: Sir Antonio Pappano. Singer: Karen Cargill. Orchestra: Scottish Chamber Orchestra. Conductor: Robin Ticciati. Berlioz: Les nuits d'ete: Scottish Chamber Orchestra. Performer: Thomas Trotter. Choir: Choir of King’s College, Cambridge. Director: Philip Ledger. Music for Holy Week: Choir of King's College. Ensemble: Kentucky Center Chamber Players. Performer: Louis Lortie. Orchestra: Bergen Philharmonic Orchestra. Conductor: Neeme Järvi. Performer: Julia Fischer. Performer: Daniel Müller‐Schott. Orchestra: Czech Philharmonic. Conductor: Semyon Bychkov. The Tchaikovsky Project Vol. 1. Music Arranger: Jascha Heifetz. Performer: Anne‐Sophie Mutter. Performer: Lambert Orkis. Performer: Johannette Zomer. Ensemble: Tulipa Consort. Performer: Michael McHale. Orchestra: RTÉ National Symphony Orchestra. Performer: Bengt Forsberg. Singer: Anne Sofie von Otter.